Life at Deaf and ASL Camp – Deaf Camps, Inc. Arriving at Camp: When you arrive you and your parents will go to the sign-in table to make sure your paperwork is in order, and then you will visit the camp nurse. If you have any medications, the nurse will hold onto them for the week. Make SURE you have permission from your doctor via the CampDoc website, otherwise the nurse won’t be able to help you. If you have emergency medications, like an inhaler, the nurse will take these and put them in a special bag that your counselors will carry. After the nurse you can visit the camp store. Sunday and Friday are the ONLY times you can buy anything from the store! More about that later. You will then be shown to your camp by one of the counselors. Your Camp and Campsite: Campers are divided into different groups: Younger Deaf, Younger ASL, Middle Deaf, Middle ASL, and Older that includes both deaf and hearing campers. We have to split up the campers to match the numbers we can accommodate in each group, so you may not know exactly which group you will be in until you arrive. 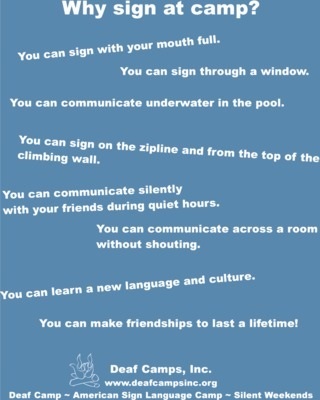 For example, some years a 10 year-old deaf camper would be in Younger Deaf, and other years they may be in Middle Deaf. Don’t worry! You will have a great time. The groups are in different locations. Usually Younger Deaf and Younger ASL are in the lodges, Middle Deaf is in the cabins and Middle ASL and Older are in the upper and lower shelter sites. The lodges are like dorm rooms and there is a large living room area in the front. The cabins are small buildings near the dining hall and pool that have bunk beds, and each cabin has a smaller room in the front for counselors. There is also a meeting house near the pool for group activities. The shelters are rooms with bunk beds, regular roofs and canvas sides. There is a common shelter with picnic tables in these areas for group activities. Counselors and Staff: Each group is lead by a group of volunteer adult counselors, and sometimes for the younger groups we have one or two 16 or 17-year-old counselors-in-training (CIT). The volunteer counselors work together to make sure the campers have a safe and fun week, and manage activities at the camp sites. Manidokan has a professional staff that organizes all the activities, does the cooking, and makes sure the camp runs safely and efficiently. The staff is fantastic, and many have been with Manidokan a number of years and have learned to sign. We also have volunteer interpreters that come to help for the week. First Day: When you arrive at your camp you will meet your camp’s directors and counselors and then be shown to your sleeping area so you and your parents can put away your stuff. Please do NOT bring any money (more about that later), food or electronics. Cell phones are NOT ALLOWED and if we find one will turn it over to the Manidokan director to be locked away for the week. Your parents can then leave, and you will then get a chance to meet your new friends. Meals: Breakfast, lunch and dinner are typically served in the dining hall and are done “family style”, meaning that everyone shares what is brought to your table. Each table will have a camper that is the “hopper”. The hopper goes the dining hall early, washes their hands, and sets up their table. When the bell rings, the rest of the campers arrive and we all say grace (in ASL) and the hoppers get the food to bring the food to the table. After the meal, the hoppers also clean up. One table is selected to sweep up after everyone leaves. Everyone gets a chance to be a hopper and to sweep. Many nights we will have silent dinners – everyone has to sign! (no cheating) If you are new to ASL, there will be people to help. Depending on the activities you have for the day you might eat lunch somewhere else … but more about that later. If your child has special meal requirements (like vegetarian, lactose intolerant or another food allergy) please make sure we know before camp starts so the cooks can plan ahead! The Nurse: Manidokan has a great nurse on staff and she works closely with the other staff and the volunteer counselors to make sure you get your authorized medications safely and on-time. If you get a scrape or a bruise, she will be there to help you out, although the staff also has first aid kits to help when you are away from the center of camp. If there is a more serious problem the Manidokan Director and nurse work together to make sure you get the treatment you need, even if it means a trip to the local doctor. Typical Day: Your days will be busy! There is always something happening at Manidokan, and you will get tired and dirty. Campers start their day with breakfast in the dining hall, and hoppers need to arrive early. Some campers have morning medications and the counselors will take them to the nurse’s office. After breakfast is Bible study*, and then it is on to the morning activities. There is a break for lunch, and then back out for another activity. In the late afternoon there is time for swimming, playing in the courtyard area and a snack. While some groups are in the pool, others have play time and snack, and then they switch. Each camper can get one drink and one snack from the camp store each day. These are paid for by Deaf Camps Inc. (donations appreciated!) so the campers do NOT need money. (remember: NO money, got it?) The campers return to their camp areas and then come down for dinner when the bell rings. After dinner there is an evening activity organized by the Manidokan staff, then chapel*. After chapel the campers return to their camp areas to finish up the evening, shower, and get ready for bed. Daytime Activities: Some days the campers have different activities in the morning and afternoon, for example you might go hiking in the morning and go to the zip line or climbing wall after lunch. Other days you might go rafting or go into Harpers Ferry to see the sights. On those days you will pack a lunch before you leave and eat along the way. Here’s an important tip about rafting on the Potomac River: you will get WET and muddy! It is definitely a favorite of most campers, but it helps to be prepared. Before you leave camp you need to put on a lifejacket and closed toed shoes that can get wet, and the lifejacket and shoes STAY ON until you get back to camp. One more time: no one takes off their lifejacket on the trip! You will have to step in the mud to get in and out of the rafts, and your shoes will be wet and dirty. Your parents may not want those shoes to come home at the end of the week because they can stink! On one of the hikes, Sawmill, we also get wet and muddy. The Pool: The pool is a great way to have fun and cool down after your daytime activities. During pool time there are at least two guards on duty, and volunteer counselors keep an eye out as well. The pool is divided into the shallow end and the deep end. If you want to swim or dive in the deep end you have to pass a swimming test. Once you pass the test you will be given a wrist band that you keep on for the week. If you do not have a wrist band you will not be allowed in the deep end of the pool. If you are new to swimming and aren’t ready for the test, don’t worry you will have plenty of fun in the shallow end and you will have a chance to improve your skills. Evening Activities: Manidokan sets up some great activities for after dinner. One thing you can think about before you come to camp is the talent show that happens on Thursday night. If you have a special talent, this is the night to show your stuff. Don’t worry, if you can’t think of something before you arrive, your counselors can help you come up with an idea, like maybe a funny skit with your new friends. Chapel*: The last activity of the day for the entire camp is chapel. Typically the service includes songs lead by the staff and a skit by some of the campers to help illustrate the message. While Manidokan is a Methodist camp, Deaf and ASL camp tries to be inclusive of all faiths. End of the Week: We hope you have a fantastic week at camp, making new friends, challenging yourself with new activities, and maybe learning a few things . After dinner on Friday evening there will be an awards ceremony in the courtyard area. This is a great time for your parents to learn more about what went on during the week. Once the ceremony is complete, you will go through the check out process where your parents will sign you out, pick up your medicines and get your things from your campsite. Hopefully you will have had a great week and be excited about returning next year.